Overheard yesterday on our first day of cycling. We arrived in Orange City in northwestern Iowa on Saturday afternoon, ready to begin our seven-day RAGBRAI adventure by riding our bikes across the state of Iowa. The tradition is for riders to dip their rear tire in the Missouri River (western border of Iowa) before the ride and then dip their front tire in the Mississippi River (eastern border) a week later at the end. Because Orange City is not within a short distance of the Missouri, ride officials brought the river water to us. Any serious cyclist knows about RAGBRAI: (The Des Moines) Register’s Annual Great Bicycle Ride Across Iowa. It all began in 1973 when The Des Moines Register feature writer/copy editor John Karras, an avid bicyclist, suggested to Don Kaul, author of The Register’s “Over the Coffee” column, that he ride his bicycle across Iowa and write about what he experienced. Kaul said he would do it if Karras rode with him. Around three hundred people showed up for the initial ride on very short notice, beginning in Sioux City and ending in Davenport. Since 1973, more than 326,650 people have ridden at least some part of the 44 annual RAGBRAIs. However, no one knows how many people have been touched in other ways along the 19,542 total miles covered by the ride since 1973. RAGBRAI has been routed through 80 percent of the incorporated towns in Iowa. In fact, the ride has become so popular that RAGBRAI officials now limit the number of week-long riders to 8,500 in order to maintain control and ensure fewer injuries. In essence, however, 20,000 day and week riders, family members, volunteers, and concession workers all move across the state of Iowa together. RAGBRAI riders come from all fifty states and many countries around the world, garnering much media attention. In 2005, Sports Illustrated named RAGBRAI as one of the 25 Summer Essentials, things that all sports enthusiasts need to do before Labor Day. It’s no coincidence that our group name is Circuit Riders. John Wesley’s plan for evangelism in America consisted of circuits made up of two or more churches called a charge. Pastors would be appointed to a charge and would travel from church to church, preaching daily in whatever site was available. They would make disciples and baptize converts, administer communion, and organize the Methodists into small groups for discipleship. These itinerating preachers were called circuit riders, who rode horses, traveled light, and carried books in their saddlebags. At times, it would take circuit riders five or six weeks to cover their entire circuit before starting over again. The Methodist Church grew to be the largest denomination in the United States in the 1800’s because the circuit riders moved west as the settlers moved west. Our team is circuit riding this week, only we’re riding bikes rather than horses. Since a galloping horse can travel 25-30 miles an hour and the average RAGBRAI rider probably covers 10-15 miles an hour, we won’t be moving as fast as our Methodist clergy forbearers. We’ll be riding 402.7 miles over seven days, with two optional loops that add an extra 48.8 miles. From what I can glean, the first religious service in northwestern Iowa may have been held in the Spirit Lake area in 1857 by Rev. Prescott, a Methodist circuit rider, several months after the Spirit Lake Massacre. In 1859, Prescott asked the Methodist conference to send preachers to the frontier settlement. One of them was the circuit riding preacher, Rev. Samuel Pillsbury. In 1865, the first camp meeting in northwestern Iowa was held in a grove at what is now known as Ft. Dodge Point. 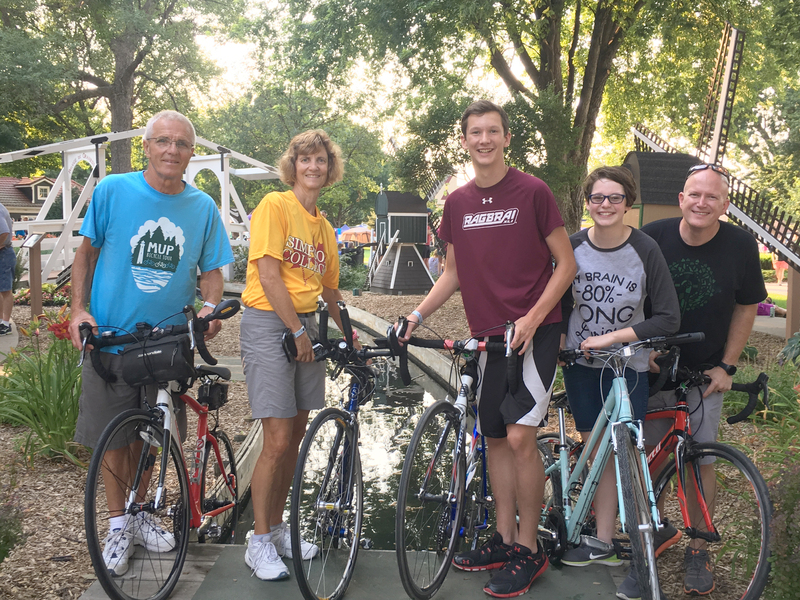 We were hosted our first night by Pastor Don and Myra Nelson and participated in the RAGBRAI Expo where we could check out the latest bike gear and enjoy a variety of food booths. Our first day riding from Orange City to Spencer was 69 miles. It wasn’t as hot as last week, but lots and lots of Gatorade was consumed. Our overnight hosts on Sunday night were Pastor Paul Frederiksen and Jane Moen at Spencer Grace UMC. Today we are on the road again to Algona with 101 miles of riding for those of us taking the long way! Thanks be to God that the circuit riders of RABGRAI will have a much more comfortable adventure this week. In fact, the riders have lots of fun dressing up, partying, and simply having a good time riding out in the Iowa cornfields. At the same time, I pray that, like the Methodist circuit riders of old, we, too, will spread scriptural holiness across the land of Iowa. By riding across the state, we want to share the good news of God’s love for all people and encourage everyone we meet to become difference makers for Christ wherever they live, work, play, and worship. P.S. We did not have spaghetti at Spencer Grace UMC tonight. We had delicious pork BBQ sandwiches, baked beans, and coleslaw. Nor did we get heartburn! P.P.S. : I hope to send brief updates of our adventures each day this week. Your presence with Don and Myra Nelson Saturday must have inspired him as he gave a whopping great message at our Rock Rapids United Methodist Church Sunday morning. Our pastor Kathy Sides underwent surgery this past week for a recurrence of breast cancer so we are having various lay members/retired clergy ‘fill the pulpit,’ (as the saying goes) during her recovery. Prayers for safe riding for the Circuit Riders and wonderful camaraderie as you travel Iowa’s beautiful (and hilly) highways and byways. And thank you for keeping in touch with your Iowa flock via this blog. Pastor Matthew Smith at Pearl River has a fabulous logo he designed of a circuit rider on a bicycle. We are using it to show support for Dr. Elmer Colyer, the United Methodist Studies prof. at UDTS. The logo would be pretty appropriate for you, Bishop Laurie! So glad our bishop is representing us well. I love how you seek to be active in such a fun Iowan way. I look forward to your posts on the Circuit Riders and how God is touching so many lives through you and your group. Blessings!